What we put into our mind matters. Subsequently, who we listen to impacts what we put into our mind. There are many voices in this world telling us what to do. When we are kids, it’s our parents. In school it’s our teachers; as an adult, it’s someone typically we care about or find interesting. This could be friends, employers, clients, or family. But we always have a choice. We control what and to whom we listen. Some (and I’m one) would argue this life is not all there is and there’s a higher power at work in this world. But we still all have a choice called free will. We can choose our thoughts and subsequent actions. We are not bound by fate. While some people’s life choices may be more limited, our thoughts never are. The ability to think and dream is endless. Many may try to tell us what to think, but we each make up our own mind. Some allow others to make choices for them because they are too young, inexperienced, incapable or unwilling to choose. But that’s still a choice. My encouragement for all of us: let’s not fall into that trap. 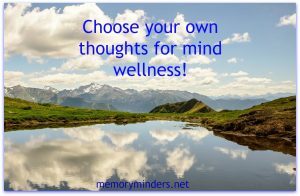 Let’s choose our own thoughts! What we choose to think is about how we think as discussed last week, but also about to Whom we listen. We were all created with our own minds to reason and believe what we wish. We don’t have to take what anyone (including me) says for granted. Let’s use the brains we were given to think clearly and redeem our thoughts and mind. It’s my passion to encourage us all to wellness in mind, body, and soul. If you haven’t already, I hope you’ll sign up for continued MemoryMinders updates. Here you’ll receive the latest strategies, research as well as updates on what’s new at MemoryMinders. If you haven’t already, sign up in the blue box and you’ll receive a free reference sheet on normal age-related memory changes and some tips to help! 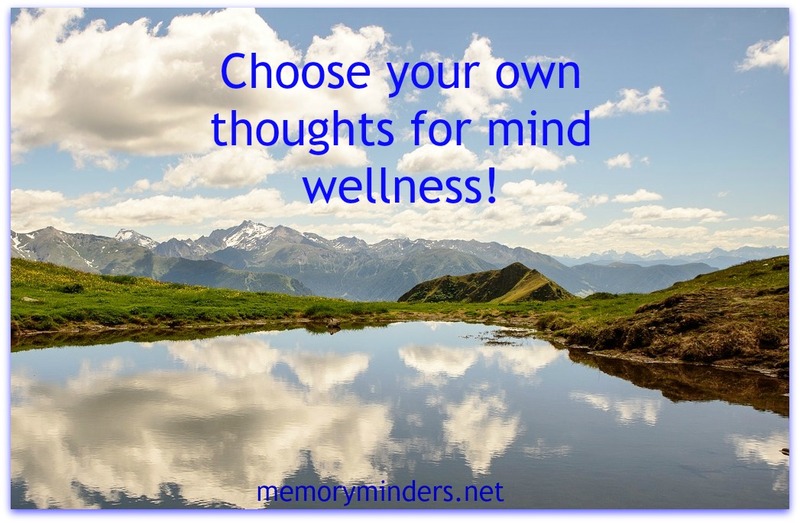 As we finish up our last week of the Spring into Wellness Challenge, here’s your Mindful Monday Challenge: how will you redeem your thoughts and move toward mind wellness? Will you try some new memory techniques or step out of your comfortable box and try new things? Will you challenge the status quo and do what you know is best, even if not a popular choice? Grab hold of your mind and choose what and who you listen to wisely. Apply your brain and direct your mind to what matters to engage you mind, body, and soul to wellness! As always, feel free to comment here or check in with me on social media for even more wellness encouragement!